I have to say I was a little surprised when a box of fly rods arrived at the front door from Carl Craig, owner of Fly Fishing Benefactors. But I am a guide and instructor that routinely puts his gear through the ringer and Carl knew these rods would get the use that would result in honest reviews of his product. I practice casting quite a bit and I’m lucky that I live within walking distance to a baseball field that’s pretty well blocked from the wind and has well-mowed grass. So when I saw that Carl sent the SAN JUAN FLY ROD I grabbed it as well as a couple of the other rods and headed for "my" casting lawn. This 4-piece rod comes in a nice black 2” cordura covered rod tube and rod sock. This is always a plus to keep the rod from being damaged when not in use. The first thing I noticed when I was rigging up the rod with a WF5F line was the hardware. Oftentimes rods in this price range come with black aluminum reel seats and standard snake guides. The SAN JUAN FLY ROD sports a classic walnut reel seat with gold up-locking hard wear, gold snake guides and generous sized tip top as well as a AAA Portuguese cork grip. With its dark maroon blank and black wraps tipped in gold metallic this rod definitely looks good and balances nicely with the FFB DESCHUTES II FLY REEL - in gold of course. Looks are nice and all, but looks alone aren’t what we’re really after here. It was time to get to the good stuff and see what this rod had in it. The rod feels light in your hand @ 3.7oz which tells me it’s an all day fishing tool. I started out with little short casts of 30 & 45 feet to targets to see if the rod would cast accurately in most fishing situations and I wasn’t too surprised that this rod casts fairly accurately at these distances. This after all is a nice fishing tool. I tried a few curve casts and slack line casts as well and didn’t have to exaggerate the motions to get the rod to do what I wanted the fly line to do. As for distance I was able to punch out 80ft without a lot of work. 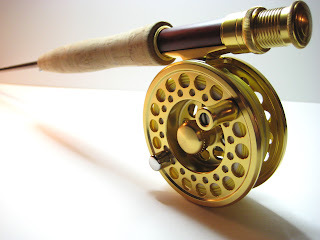 I have been fishing with this rod over the last couple of months both on a tailwater as well as a larger mountain stream and have enjoyed fishing with it. It can handle aerial and on water mends to keep a drag free drift of a size 18 dry fly, it handles multiple fly rigs, weighted nymphs and streamers nicely as well. The rod tip is soft enough to feel subtle takes as well as protect fine tippet, yet the rod seems to have enough back bone to handle bigger fish. I plan to fish with this rod and continue to offer it to clients to fish with as well, so there will likely be an update to this review in the future. Carl did a nice job getting this rod set up for his product line and with a moderate price tag - has set up one of the better deals out there.